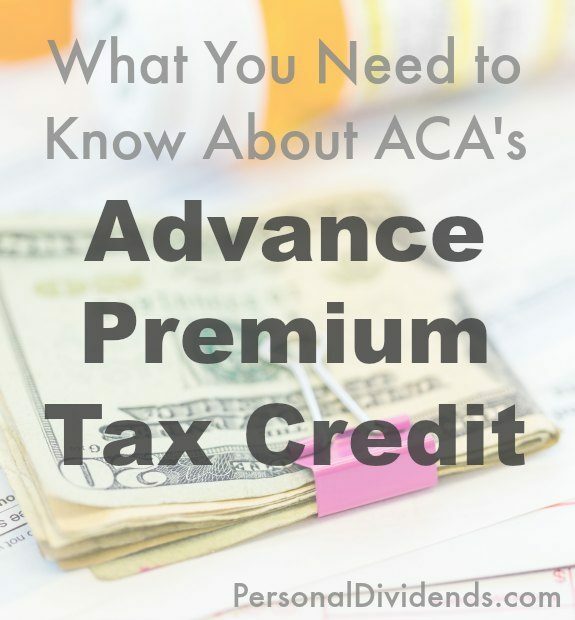 One of the issues that is coming up this tax season is confusion over the Advance Premium Tax Credit (APTC), which is part of the Affordable Care Act (ACA — also known as Obamacare). When you’re buying health insurance on one of the exchanges, you might be able to get a subsidy, in the form of a tax credit, based on your income. I received some helpful information from Alison Flores, a lead tax research analyst with The Tax Institute at H&R Block about the APTC, and what you should know about it. In order to help offset some of the costs associated with requiring everyone to buy health insurance or pay a fee, the ACA includes a tax credit to subsidize the cost for certain consumers who meet income requirements. The APTC is figured when you sign up for your coverage through an exchange, and it is applied through a reduction in what you pay for your monthly premium. You also have the choice to wait on receiving the credit. If you choose to wait, you can claim the credit when you file your taxes. Claiming a Premium Tax Credit when you apply means that you might get a bigger tax refund later, but you will have to pay more out of pocket during the year. One of the problems with taking the APTC is that income changes during the year can change your eligibility for the tax credit, as well as change the amount that you can claim. The APTC (or Premium Tax Credit) is available for those with income that is between 100% of the federal poverty level, and 400% of the federal poverty level. If your income is below 100% of the federal poverty level, chances are you qualify for Medicaid, and should be using that program. If you make more than 400% of the federal poverty level, you don’t qualify for a subsidy. What Happens When Your Income Doesn’t Turn Out as Planned? When you sign up for coverage through a marketplace, you enter your income information and your subsidy is calculated. If you take the APTC, you basically receive your subsidy each month. Later, if it turns out that your income didn’t match up with the estimate, you might have to repay some of the subsidy you received. You or a family member must be enrolled in a qualified health care plan through one of the health insurance marketplaces set up through the ACA. The marketplace estimate at the time of enrollment showed that your income would be between 100% and 400% of the federal povery level for the year. The APTC payments were authorized and paid for during at least one month of the tax year. If the income really had been between 100% and 400% of the federal poverty level, you would otherwise qualify for the tax credit. Even if you meet those requirements, you might still need to repay some of the subsidy received. However, there are caps on how much needs to be repaid. The other situation is one in which you ended up making more money than you expected during the year. If your income increases to the point that you make more then 400% of the federal poverty level, your ability to receive the subsidy would have been phased out. You might end up owing more at tax time. If you have bought health insurance through a marketplace, and you are receiving the APTC to help offset some of the cost, it’s important for you to stay on top of income changes. You need to notify the marketplace when you have a change in income. That way, your subsidy can be recalculated as soon as possible. This can be challenging for some consumers, since we are used to setting up our health insurance plan for the year, and then not worrying about it again. If you’re going through the exchanges, though, and you have received a subsidy, it’s important pay attention to changes, and submit new information.